At 23-years-old, Lis Hartel contracted polio while pregnant. She remained paralyzed from the knee down in one of her legs for the rest of her life. No one imagined that Lis would ever compete again. In 1947 she proved them all wrong. She was selected for the Danish Olympic team. In 1952 Lis and her horse Jubilee won a silver medal at the Olympics in the individual dressage event! They came back in 1956 and won the Olympic silver AGAIN in the same event! Watch Lis and her horse perform in the video below. The video is not narrated in English, but the beauty shines through in any language! Nothing could stop her! Lis is an INSPIRATION! Share this on Facebook if you agree! 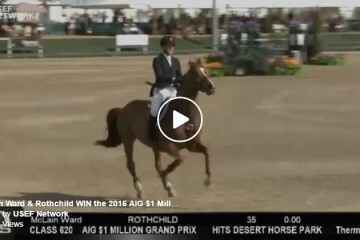 This Is What A Million Dollar Ride Looks Like – McLain Ward And Rothchild Win AIG $1 Million Grand Prix! Horse Free Jumps In Slow Motion – The Coolest Thing You’ll See Today!